“What’s happening in Korea?” and “How’s Korea now?” are the most frequent questions I was asked and asked my friends in Korea. As an exchange student from South Korea, I was enjoying my time until “the scandal” broke. Whenever I was questioned about the scandal that had engulfed my country, I was embarrassed and ashamed. Born and raised in South Korea, where face and respect matter a lot, this scandal was not pleasant news for me and for all the people in Korea. Even so, when I heard the response of Koreans to this crisis, though less-reported than the bizarre affair itself, the disappointment brought by the scandal turned into the pride of Koreans. Despite the cold weather and the festive mood of Christmas Eve, South Koreans marked the ninth consecutive week’s candlelight vigil by gathering in the capital's Gwanghwamun Square on Saturday. The protesters demanded a swift decision on President Park, who was alleged of letting Choi Soon-sill, her longtime confidante with no official government role, intervene in state affairs. Later, President Park’s impeachment was approved by the parliament, while Ms. Choi has also been charged with abusing her relationship with the president to shake down the nation’s conglomerates for donations to her own non-profit foundations. She was also alleged of pressuring Ewha Womans University, one of the prestigious universities in Korea, into giving her daughter, Jung Yu-ra, preferential treatment to get into the university. The outraged students at Ewha started the first protest against the unfair treatment, which helped reveal the secret relationship between President Park and Ms. Choi. Although the scandal is shocking, demonstrations against the president are nothing new. As a country with a turbulent history, demonstrations, especially violent protests, are already a common way to express people’s anger. During the Independent Movement in the first half of the 20th century, approximately 2,000,000 Koreans participated in more than 1,500 demonstrations against the Japanese occupation of the Korean Peninsula, and 7,509 people were killed by the Japanese police force. The pro-democracy activities in Gwangju in May 1980, when participants from local universities were attacked by Chun Doo-hwan government, triggered a 10-day-protest and caused 606 deaths. Hundreds and thousands protested the American military presence after a U.S. Army vehicle hit and killed two young girls during training exercises in 2002. Moreover, in September 2016, an elderly Korean man who protested Park Geun-hye’s agricultural policies died from injuries after being hit by a police water cannon. Based on past demonstrations, the first thing comes my mind is chanting people or policemen clashing with protesters. However, this time was totally different. While there were blockades of hundreds of police, there was not violent crowd. Various kinds of people, ranging from children with parents, middle high school and university students, workers and even old people marched peacefully. “It was more like a festival than a demonstration. 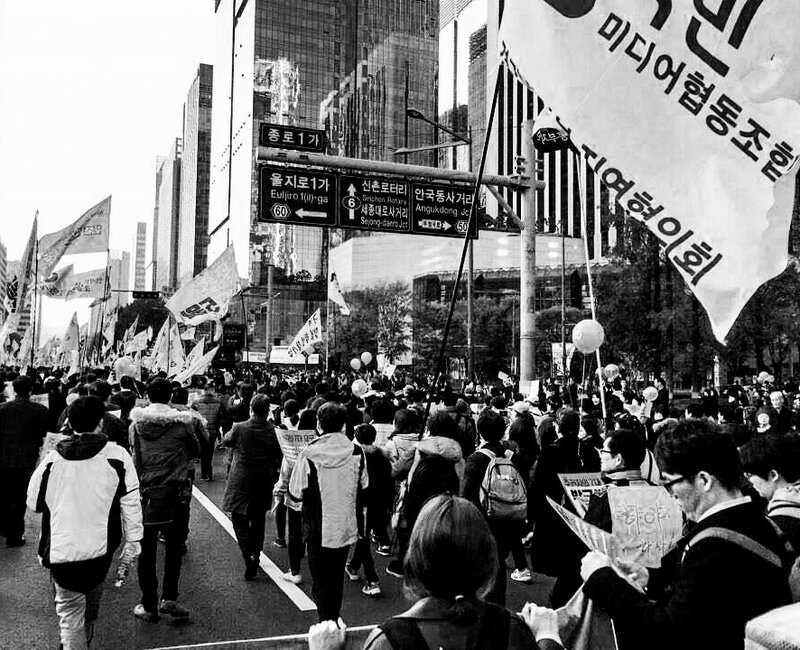 Unlike past protests, everyone was talking to each other and listening to each other’s story, and walking in an orderly manner,” said Ms. Chea, a 21-year-old Ewha university student. These kinds of protests are all new to Koreans who are more familiar with violent protests. Whenever people wanted to make their voices heard, there were always tragedies. However, people’s resolve to act in a mannerly way to avoid another bloody protest made them choose to express their anger via peaceful marches this time. “These days, we can see that young people care more about peace and try to act well. We can also see this on the SNS about how we should act during a peaceful march,” said Ms. Kim, 24, a Sungshin Women’s University student. Instead of chanting or shouting, the majority of the protesters gathered together, sharing their thoughts. “It was really nice to see people sharing their thoughts. I realized that with a little courage people can actually make a big change,” said Ms. Eum, 25, a graduate student from So Gang University. In addition to young people, there was also one special group of protesters: parents who bring their children. In this way, they hope their children can witness this historical moment and show them how to act, so that the same situation won’t pass down to the next generation again. A million people participated in the 10th consecutive rally on the last Saturday of 2016, proving people’s desire to change this whole situation is stronger than ever.